Pat, Ron, Jenny and Laura went to Woodbine for a night of dinner and standardbred trotting to celebrate Pat's birthday. Jenny and Laura made a little; Pat lost a little. Ron did worse. Jenny's midterm summer school English report is good - she's finally taking it seriously. She tried changing her hair colour to red, and is now trying to fix it. Katy's at her friend Jen's more than at home - and will be going to her cottage next week. Ron visited Andrew and took some new pictures of the Rock n Roller coaster under construction at Disney MGM Studios and Universal's Islands of Adventure. Andrew and Kelly and a lot of other cast members went to Cape Canaveral on July 15 to watch the new Disney Cruise ship's arrival from Italy (originally expected to arrive in the Spring). He said that it's one impressively large ship and is looking forward to his cruise on it in late August. Tasha has resumed her Training Diary on her website. 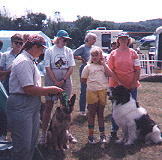 with new entries on her Schutzhund and obedience training. She's been training for her parts in a Disney TV movie, filming next week! Andrew reported that the wildfires in Florida have not directly affected Disney property, with the execption of one lightning strike in some woods near I-4. However, all of the fireworks displays, especially the 4th of July, have been cancelled, and the attendance in the parks is lower than expected. Seems that there are fewer people driving in from within a day's drive of the park, with all of the publicity about the Florida fires. 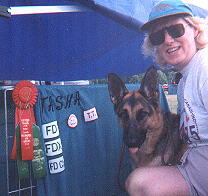 Pat has new pictures of Tasha in her Schutzhund training on Tasha's website. She had a good time, and her custom made dress looks great, n'est-ce pas? She went to Edgefest/Barrie the next day (July 1st), so that got her home at a reasonable 1:30am. Andrew and Kelly made it back from Buffalo without incident on Monday June 29th. They flew Delta, and with discount airlines AirTran and Kiwi serving the area, managed to snag a $110 US one-way airfare from Buffalo to Orlando. With the $100 US cost of the rental car, the week's vacation was a good deal.